Haven’t decided on a hotel yet? You can look at other available hotels in the Alsace and Lorraine regions with Booking.com. Two separate regions often spoken of in the same breath—thanks to four changes of nationality since 1871—Alsace and Lorraine each offers the visitor a distinct culture and landscape. Alsace’s German roots reach back to its 700 years as part of the Teutonic Holy Roman Empire. 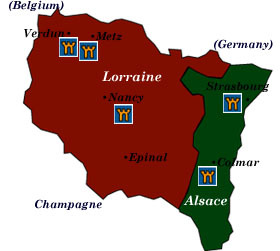 Lorraine was associated with the Holy Roman Empire, but fell under the rule of French and Burgundian dukes. Situated between the forested Vosges mountains and Germany’s Rhine River, the Alsace region charms with unspoiled, picture-perfect villages with half-timbered houses bursting with brilliant flowers on their window sills, ancient churches, and hillside castles. History enthusiasts will find plenty of sites to visit in Lorraine. One can visit the birthplace of Joan of Arc in Domrémy-la-Pucelle, as well as fortresses and abbeys which give further testament to the region’s ancient past. Especially poignant are the memorials in Verdun, site of one of the most bloody battles of World War I. The Alsace Wine Road Taste dry Reislings to sweet dessert wines at over fifty vineyards along the “Route du Vin d’Alsace,” which stretches from Colmar to Rosheim. Along the way you’ll pass ancient castles, abbeys, and charming, flower-filled villages. Cathédral Notre-Dame de Strasbourg, a 12th-century glory of Romanesque to Gothic architecture. The Musée de l’Oeuvre Notre-Dame displays the celebrated medieval and Renaissance art that the cathedral once held and more. Palais de Rohan, an 18th-century palace now exhibiting Roman and medieval artifacts, as well as housing the Musée des Beaux-Arts. Colmar Fortified since the Middle Ages, today’s Colmar is the most beautiful town in the Alsace region. Medieval and Renaissance half-timbered buildings still hang over narrow cobbled streets. Take a break from strolling the town’s peaceful canals and stop by the Musée d’Unterlinden, a former Dominican convent that houses the acclaimed Le Retable d’Issenheim (Issenheim Altarpiece), considered one of the most dramatic art pieces in the world. Maginot Line If you consider the size of major military installations of the world, the Maginot Line was second only to the Great Wall of China. Of course, the Germans simply went around this defense network to capture France in WWII. Parts of the Maginot Line may be visited. In Alsace, they are: Four-à-Chaux and the Fort de Schoenenbourg. See below for sites in Lorraine. Musée de l’Ecole de Nancy and the Musée des Beaux-Arts. The former 13th-century palace, the Palais Ducal, now hosts a museum, featuring exhibitions from every era of Lorraine’s history. Metz Dating back to Roman times, this now-modern city can boast a magnificent Gothic cathedral. Especially notable is the Cathédral St.-Étienne and its original stained-glass windows from the 13th to 20th centuries, including one by artist Marc Chagall. Joan of Arc Country France’s patron saint, Joan of Arc was born at Domrémy, and you may visit her birthplace and other sites associated with her childhood. At nearby Vaucouleurs, Joan pled with the governor to allow her to lead her armed soldiers to Orléans. In 1429, she passed through the Porte de France to meet her destiny. Maginot Line More than a dozen sites in Lorraine are open to visitors. Among the most popular are: Fort du Hackenberg and the Fort de Fermont. Verdun Battlefields Considered one of the most horrific battles of WWII, over one million men sacrificed their lives over the course of a year. Today, you can visit museums, battle sites, and memorials to their memory. Follow the signs “Champ de Bataille 14-18.” The American Battle Monuments Commission oversees the American Memorials.